public Concert of A Capella Champions that evening at 7pm. 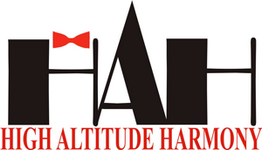 High Altitude Harmony is a Toowoomba based men’s a capella, four part harmony (barbershop style) singing group who have been singing as a group since 2008. We sing in many events across the Darling Downs and also in state and national competitions and you can have a listen few of our performances or come along to one of our weekly rehearsals. Why not attend one of our up coming concerts - see the bottom of the home page for date and links to further details.